The results of the 2019 Flag Day Fautasi Race held Saturday have been added to the history booksm, along with calls to make the safety of crew members a priority in future races. The captain of Manu’atele’s Matasaua, Malaepule Fuega Moliga expressed utter disappointment with the Race Committee at a meeting with captains following Saturday’s race. He said the committee showed complete disregard for the safety of crew members of fautasi which were submerged or capsized out in the open sea. He said thankfully no one was hurt but a life could have been lost which would have marred the Flag Day celebration. Malaepule said his boat the Matasaua took on water before the race started and there was no help at all. He said boats just passed them by and by the time help arrived some of their crew members had floated close to the airport. A Matasaua crew member, Kidman Sea, told KHJ News it was a scary experience out there. 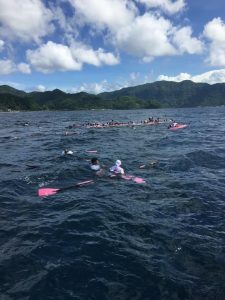 A rower for four years, he said their fautasi filled up with water before the race started and it took almost 3 hours before they were rescued. He said a National Park boat came to them and they asked if they can hop on but the answer was no. A second boat that came by also said they couldn’t take them. Several other motor boats passed them, without offering any assistance. 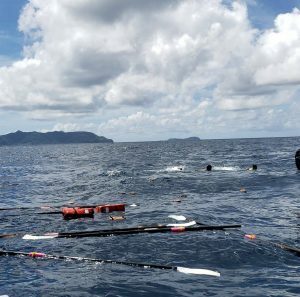 “They didn’t save us until after the race,” said Sea. One of the Matasaua crew members, Galo Tuiolosega, is reported to have suffered internal bleeding. Sea said a race is worthless if it ends in a tragedy. He gave a shout out to the Aeto and Fono crew members who were also in the same situation as them on Saturday. The Aeto Captain Rev. Patolo Mageo also expressed disappointment during the captains meeting . he said he thought after the committee saw what was happening to their fautasi that they would make a decision to call off the race. 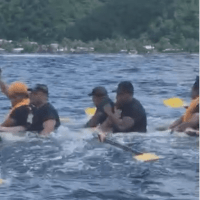 Acting Governor Lemanu Peleti Mauga and Secretary of Samoan Affairs Mauga Tasi Asuega offered apologies and stated that nothing is more important than the safety of the rowers. They thanked the captains and villages whose fautasi were unable to race. Lemanu made official the results of Saturday’s race, 1 Paepaeulupoo from Aua, 2nd Manulele Tausala from Nuuuli, 3rd Fuao from Vatia. 4th, Taema from Leone, 5 Iseula o le Moana from Fagatogo, 6, Fealofani Samoa from Fagasa and 7th Fetu o le Afiafi from Fagaaalu. There was agreement among the captains that the three fautasi that were able to race should receive prize money. There was also a suggestion that they have a friendly race today however the suggestion was not supported. The Committee has not disclosed what the prizes for the fautasi race will be. Fautasi race was an event that people had looked forward to watch every flag day and now this event excitement is gone. Thank you for taking the fun and excitement away. They should have known their boats were all pala and falling apart but they let their excitement cause them to to lose sight of safety first. How embarrassing that there were HC as captains that did not feel it worthy to save lives, instead to win money. I’m sorry, but this territory has been doing this fautasi race for years. You mean to tell me there were no jet ski’s or emergency personnel on stand by for this type of issue? There was no protocol as to what would happen to save lives and to mitigate emergency health issues in water? There was no ASG coordination between DOC-Port? Years and years of racing and these fathers and grandfathers are stranded at sea while other villages cheer on their fathers? I’m sorry, but where is the Amerika Samoa pride in this event? Acting Governor Lemanu, as a former military personnel and acting governor, what a complete disaster. You sat and watched a race and let those men float at sea without doing anything? But, you sat and watched a fautasi race while men were stranded at sea? I don’t know what is worst, your actions as the acting governor or your actions as a military personnel that should never prioritize an event over lives. I’m sorry, but this entire event is a complete disaster. What a terrible stain on the history of fautasi in Amerika Samoa. Fautasi races should always be an event on Flag day, not one or two days before. Thats why we have all these dramas with the committee n their messed up plans, boats being damaged or overflowed with water n not a single committee boat offered assistance. Its wasting all the boats efforts, time n all the strength that all have given in rowing for their villages fautasi. Sili ai loa ona fire le komiti, ma taofi tuuga vaa mo le aso o le fu’a e aua le toe faia ae sauni uma vaa mo le tuuga a le DOC. Faamalo lava I e sa faamaoni ia ma e foi sa le’i faamaoni..happy Flag day American Samoa. Personally, these high chiefs, senators and faipules need to give the fautasi back to the people. How can we own our boat when these big guys want to grab the lead positions for the glory. You old guys ought to lead from the shore. Let the young chiefs navigate. They lead with the villages heart. Yet when something happens the high chiefs, faipules and senators squeal the loudest and grab the mostest, ignoring the rowers and the villagers. Manuka don’t point fingers to the national park vessel. Your capt jumped ship and clambered up the vessel leaving you all crew members in your sinking fautasi. In fact the capt. Of the Fono fautasi had to chastise your cussing, undisciplined, disrespectful manners from the deck of the NP vessel. The bottom line is, our leaders should look into this matter closely. I just hope that we will have a peaceful flag day. Leaders be a leader please. Aua tatou te faiase mea e vevesi ai nuu ma afioga. When are you future rowing athletes going to TAKE CONTROL to the race situation??? The boat doesn’t move unless it has rowers. Its time for ALL crews to cut a new deal with your Village before you step foot on the fautasi in the future. Points for all rowers to consider. 3). It should be each villages responsibility to prepare for the safety of their crew on the water NOT the GOVERNMENT. Life has its risks, if you aren’t mature enough to plan your own fate, why should the government be responsible for each and every one of you when you leave the dock? 4). Force your village to take the political decisions made on the starting line away from the government. Its very easy to start these races if the race committee uses flags (not just sound), with 3 minute warnings, 1 minute and zero. Any boat over… no money later (don’t expect your Matai to go wine to the governor after the race to get paid if your captain’s bow is OVER the starting line when the flag drops! 5). Standardize hull designs, built locally. Why spend $300,000 on a Kiwi design when the designer never rowed! We all love fautasi racing, especially the crew. A chance to get out on the water during practice and smell the fresh air, watch the sunsets over the mountains and lose some weight. So guys, if you really love the sport take the starts away from the politicians, then WE can all enjoy a great day of racing. Just can’t help but to laugh at the STUPIDITY of it all. In the age of smart phones and smart cars, you all remain primitive like minded. 2020 and safety is but an unimaginable concept in the minds of the Samoan people which is evident all over the islands. Kalofae…fiber glass designed lake boats are no match for the unpredictable pacific ocean, and yes Samoa, it is not the Pacific Lake…LOL! Personally, instead of you captains showboating and pointing fingers to the committee how about this thought..
1-You have no knowledge of the condition of your boat or its make to determine if it is seaworthy and what type of ocean conditions it can tolerate for a safe run. 2-You cannot read the oceans current, temperature or color. 3-You cannot read the weather conditions. How can you be a tautai when you failed in your own responsibilities as the CAPTAIN. Because you lacked the knowledge you couldnt even argue or make a decision for the sake of safety before you launched. You couldnt even react when the ocean or weather shifted. Some of you couldnt even control your rowers who turned into an ugly undisciplined rabble at sea further complicating the situation. You lost control of your crew and boats. Everything that happened could have been prevented if you hadnt lead with arrogance and pride. If, you knew how to read and understand the signs a true navigator would know. At hindsight, which one of you kept his head and brought his wounded fautasi and crew back home under such frightening circumstances.